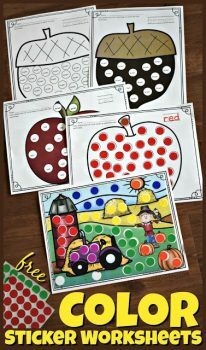 Your children can practice both their color recognition and their fine motor skills with these lovely Fall Color Sticker Worksheets from 123 Homeschool 4 Me! There are 14 pages, each with a unique design and circles for colored stickers. Each circle states the color needed, and at the top, there is space for your child to trace the color word as well! If you’re looking for other color recognition resources, check out Colors Look-and-Find Sheets and more! Check out the Fall Color Sticker Worksheets here!